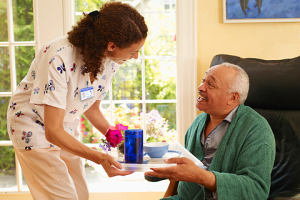 The concept of home health care has grown dramatically in the last several years. As the dynamics of the modern family have shifted (smaller extended families, homes where all the adults are working, etc. ), many of the functions a relative would have performed in the past are being outsourced to organizations that can meet these needs. Being able to provide quality services in the comfortable and familiar setting of the patient’s residence has become part of the mission statement of these mobile medical providers. Being able to provide education and assessment to new mothers and their babies just home from the hospital fulfills a vital role that may have been traditionally performed by a family member. Having a trained medical practitioner on hand can get both mother and child started on the right path. Often, individuals who have had major surgery require follow-up attention, even after being discharged. Transportation may also be an issue; particularly if the patient is not able to move on their own. Having these evaluations performed at the residence is both convenient and more comfortable for the person who is recovering. Taking care of the elderly who are dealing with medical issues but want to maintain the independence of living on their own is one of the traditional roles of home health care providers. These regular visits help these senior members maintain a good quality of life while having the knowledge that their medical needs will be met. The need to provide medical and emotional support for these individuals to remain a part of the community is an important function of these traveling caregivers. For younger individuals who are recovering from an injury or accidents, and otherwise can manage their own affairs, having the knowledge that a medical professional is on hand adds a layer of comfort as they regain their active lifestyle. Diseases like diabetes, kidney disease, Alzheimer’s, and heart failure require constant monitoring. Many of those dealing with these chronic issues still want to live on their own and may not require the constant attention of an assisted living facility. Regular visits help these patients maintain their independence without having to sacrifice the medical oversight that they need.